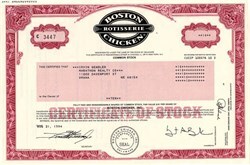 Beautiful certificate from the Boston Rotisserie Chicken issued in 1997. This historic document was printed by United States Banknote Company and has an ornate border around it with a vignette of the company logo. This item has the signatures of the Company's Chairman and Secretary and is over 17 years old. We have not seen many of these certificates. 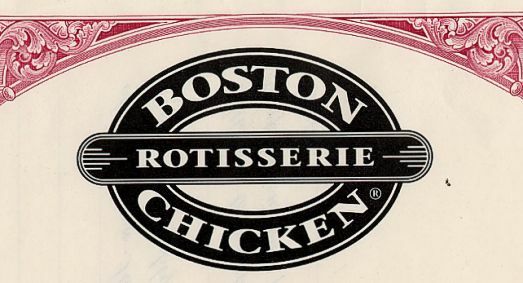 Founded in Newtonville, Mass., in 1985, Boston Chicken built a nationwide business on homestyle food: mashed potatoes, gravy and rotisserie chicken. The company's initial public offering was priced at $20 per share in November 1993, quickly shot to nearly $50, and split two-for-one in 1994. Many analysts thought that the company was overvalued due to scant revenues, but it grew quickly over the next several years. At its peak in 1996 the company was worth more than $2.7 billion. However, rising debt costs and competition from grocery stores selling rotisserie chicken eventually pressured the company into bankruptcy. On December 02, 1999, McDonald�s acquired the Boston Market chain for $174 million. Boston Chicken had been attempting to reorganize since October 1998, when the company filed for Chapter 11 bankruptcy protection. McDonald�s offer beat out Texas entrepreneur Jack Baum for $140 million.